Surgery for Morton's Neuroma & Recovery, or, "You're going to do WHAT to my foot??" NOTE: This is a somewhat long, rambling post. I'm writing this to help others who are facing surgery to correct Morton's Neuroma and to describe my recovery process and progress. I'm 35, 6'2", weigh 190lbs, and wear a size 13 (US) shoe. So, yeah, big feet. I've always had a hard time finding shoes that fit well, and usually made the stupid choice of style over comfort. That was never much of a problem...until this year. I work in the fields of science & technology and have had a fairly sedentary desk/office job for more than 10 years, plus I live in St. Louis, where everyone drives everywhere. Two years ago I started frequent domestic & international travel for work. One of the aspects of travel I enjoy most is being on foot much more than at home. Towards the end of 2009 I started noticing some uncomfortable tightness & pain in my right toes, foot & ankle, but just brushed it off as aches & pains associated with getting older & not being in prime physical condition. This continued through the spring of 2010, with the pain getting worse & becoming more persistent. No longer was it just the occasional "ouch" when walking on an uneven surface - I would wake up feeling like my foot was on fire, and have sharp, shooting pain through my toes & up to my ankle every time I put my foot down. Without realizing it, I started walking on the outer edge of my foot to avoid the pain, which then started causing my ankle to hurt more & swell. Not exactly a good situation. I finally went to my physician in late spring & was first referred to a podiatrist. He poked & pressed around on my foot & ankle in ways that made me squirm, and not in a good way, so he ordered up some xrays. The first round showed what looked like fractures in a couple of metatarsals (the bones that run from the base of your toes to your midfoot) so he sent me for an MRI. It showed that I had torn tendons on my ankle and stress fractures that had rehealed in my 2nd & 3rd phalanges & metatarsals (toes & foot). He then referred me to an orthopedic surgeon, and that's when things started getting medieval. The orthopedist reviewed my MRI & did her own xrays, plus talked with me about all the pain I was having. Her diagnosis was that I had a neuroma, or nerve tumor, between my 2nd & 3rd toes caused by the improper healing of the broken metatarsals, as well as poor bone morphology. Long story short (by this time it was September): the 2nd & 3rd toes on my right foot are more closely aligned than normal. I did something (don't know what, exactly) that caused those bones to fracture. They healed on their own, but not perfectly, and so those crazy cracked bones were grinding on the nerve that runs between them. That damaged nerve was causing the shooting pains, which in turn was causing me to walk in such a way as to avoid the pain, which was tearing tendons in my ankle. So then, to treatment. Apparently you can't do an xray or MRI & see if you have a damaged nerve, so you literally have to take a shot in the dark - a cortisone shot directly into the nerve. Now listen, I have a very high pain threshold (piercings, tattoos) but that mother HURT! But it worked. My foot was numb, like your mouth feels after getting a shot at the dentist, and for the first time in months it didn't hurt or ache or burn. Success. I was also sent for physical therapy, which didn't do a damn thing. I got special inserts for my shoes, which helped alleviate a little bit of the pain, but not enough to make a difference in my daily activities. Frustrating & expensive. On my followup visit with the orthopedist we talked about next steps and because the cortisone shot was so effective, she considered me a good candidate for surgery. As in, surgery to remove the damaged nerve. As in, cut open your foot, hack out the nerve, sew it back up, send you home. This freaked me out a little bit. I wasn't worried about the surgery itself, I was worried about the recovery & long term side effects. My doc talked me through this - because the nerve is removed, I'd be left with a numb spot on the top & bottom of my foot along the incision, plus the inner sides of my 2nd & 3rd toes would be numb. The numbness would not affect balance, and following recovery I'd be able to walk normally & return to activities that I'd given up because of the pain, namely going to the gym & doing yoga. But, wow, it's irreversible, optional surgery. I mean, it's optional in that I wouldn't die if I didn't have surgery. And you know, once you cut out a nerve it's gone - it can regenerate a little bit, but it's not like it's going to magically grow back & be 100%. So I was facing a difficult decision: have the surgery & be left with a numb spot on my foot, or don't have the surgery & be left with a painful spot on my foot. Plus, I read a few web sites & forums from people who had had the surgery; some with good results, some with bad results. This post in particular & its comments scared the bejesus out of me...so much so that I got a second opinion & had a very lengthy followup with my doc to make sure I was making the right decision. And so after a lot of consideration, I opted for surgery. And I don't regret it one bit. The surgery itself was a snap - outpatient, in & out in 7 hours. My partner was traveling for work & couldn't change his schedule, so my best friend Tagert took me to the facility. I was admitted, did the paperwork, assigned a bay & bed, got an IV, met with my surgeon, laughed over the mark she put on my foot, waved to the camera, and then Dr. Feelgood came in to give me meds and it's all a blur after that. I sort of remember being wheeled out of the bay into the OR, and kind of remember cracking some joke as they moved me to the operating table, but seriously, I woke up in recovery & thought I'd just dozed off. I was surprised to see that my foot was all bandaged up & the surgery was over. I had no adverse reactions to the anesthesia, so I had a couple of crackers, a little bit of juice, and was sent home. Yes, really. Tagert stayed with me that night while my partner was out of town, and two neighbors came over to help get me food & get me situated. I was on heavy narcotics (Norco; LOVELY stuff) every 4 hours, along with a few other meds for inflammation & to prevent blood clots. For the first 3 days my foot was completely numb from the anesthetic block. It felt like concrete - just numb & heavy & useless. I kept my foot elevated - "toes above your nose" - with the help of pillows, and got off the couch as little as possible. When I did get up it was for short periods of time only and I had to use crutches to get around. I have to say, and I know it may sound bad, but honestly it was a really restful experience - wake up, take a pill, watch TV, fall asleep, repeat. My two dogs were with me, one of whom got to spend all her time on the couch next to me. Time had no meaning or importance. As the Italians say, "Dolce far niente" - it is sweet to do nothing. 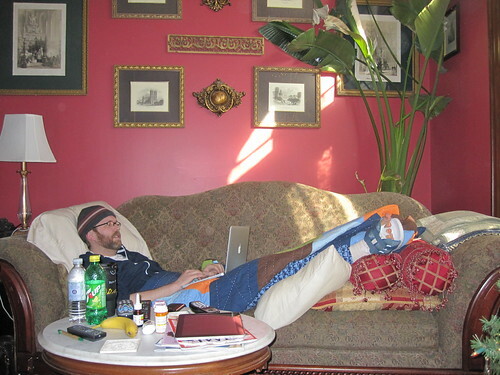 On my 3rd day after surgery (a Thursday) I returned to work via couch & laptop & wifi. On that Friday I thought I'd be brave and start cutting back on the pain pills. Big mistake. Huge. The pain started edging in & then all of a sudden it was so intense & so present that it made me sick to my stomach. I got right back on the Norco horse & rode it through the weekend. On my 10th day after surgery I went in for a checkup & had my bandages removed & stitches out. That hurt like hell. As of this writing I'm on my 4th week of recovery. Between that first week & now I've gotten off the pain meds, but am still taking aspirin to reduce the risk of blood clots. I am driving (something I couldn't do while stitches were in) and I've ditched the crutches. I use a cane when I'm outside the house because I still have limited flexibility in my toes & the cane helps me move around with stability. I've returned to work, and all things considered, once again am a productive member of society. And so what everyone wants to know is: is your foot numb? The answer is yes. I have about a 2" numb spot on my foot that follows the incision, and those inner sides of my 2nd & 3rd toes are numb. I still have normal nerve supply to the other side of each toe, and the doc said that there were small fibrous nerves in the top of each toe remaining, so overall I've only lost a very small portion of feeling in my foot. I'm gaining flexibility and am able to be on my feet for longer periods of time every day. The other thing people want to know is: would I do it again? The answer is yes, absolutely, because I'm free from pain. For the first time this year I'm able to wake up without feeling like my foot is on fire. I can walk without feeling like I'm stepping on nails every time I put my foot down. I feel like I have my life back, and that is wonderful. If you have been diagnosed with a neuroma & are considering surgery, please read any & all of the above as the experience of one person. Overall my experience has been good, but I have heard from others who have had less successful procedures. I think for me it was finding the right surgeon & working with her to make sure this was the right procedure for me. I have had the luxury of a healthy stockpile of sick time & vacation days (as well as doing this during the holiday season) which has allowed me to be at work when I'm able to be productive & at home when I'm not. I also think I came into the surgery with realistic expectations of what I'd be able to do during recovery & afterwards, and so while my dreams of being a professional dancer may be over, I'm able to do my actual professional work without pain & suffering. Last thing: I could not have made it through this recovery time without proper support, both physical & emotional. For physical support of my foot I got a pair of orthopedic Crocs. Now look, I'm not a fan of Crocs. I think they're ugly and I've never understood why people wear them...until I put these on. They are light, they are comfortable, they are quite possibly the smartest purchase I've made in years. This particular line has an extra wide toe box that makes for easy on & off without pain or fuss. If you're going through any kind of foot surgery I highly recommend these. As for emotional support, I've always been an independent person but there's no way I could have gotten through this without the help of my family & friends. You *have* to have someone around in your first week to be your feet & hands - to go get things for you, to run errands, to bring in the mail, that kind of boring, normal stuff - because I'm convinced that my successful recovery is due to taking it completely easy for as long as possible. So to everyone who has helped me, I give a huge THANK YOU! I wrote this for the sake of sharing information about my experience with Morton's Neuroma surgery & recovery. If you're facing something similar, I hope you find this helpful, and I'll be glad to talk with you or answer any questions you might have.